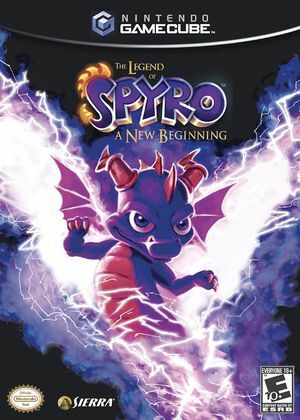 The Legend of Spyro: A New Beginning is the first game in The Legend of Spyro trilogy, a reboot of the Spyro the Dragon series. It was developed by Krome Studios for the Nintendo GameCube. A New Beginning uses a more action-based focus than previous Spyro games. Rather than the previous focus on platforming, the gameplay is now more combat based. Spyro has a variety of combat moves as well as four different breath attacks: fire, electricity, ice and earth, which he can use as both long range and short range attacks. Spyro can also use furies, huge blasts of elemental energy. The game has fewer levels than previous Spyro games, with six levels that progress from a starting point towards a final destination and boss encounter in a linear fashion, and two rail shooter style flying levels adjoining them. The Legend of Spyro: A New Beginning has a native 16:9 display option, but it requires enabling it in its internal options and setting Dolphin's Aspect Ratio graphics setting to "Force 16:9". Using the widescreen hack with this title is not recommended. Certain glowing light sources will be broken and stretched from their source to the bottom of the screen. Unchecking "Store EFB Copies to Texture Only" seems to fix this issue. The graph below charts the compatibility with The Legend of Spyro: A New Beginning since Dolphin's 2.0 release, listing revisions only where a compatibility change occurred. This page was last edited on 18 November 2018, at 03:19.